The Open tab on the File menu shows a list of files you’ve recently opened, and it includes links to places where you commonly store files. The Recent list shows the files that you opened recently from any of your devices. If this list gets unwieldy, you can remove files from it. Just right-click the file name and then pick Remove from list. You can make other changes to the Recent list. To learn more, see Customize the list of recently used files. If you don’t use the list of Recent files, and you’d rather jump straight into browsing folders, use Ctrl+F12 to open the Open dialog box directly. 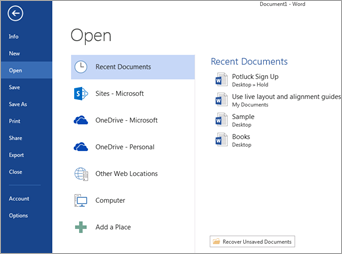 To access files from your Office 365 Groups or SharePoint Online document libraries click the Sites - Your Company link. You'll get a list of your frequently Groups and Sites to select from. Pick the one you want and browse to the file you want to open. Double-click Computer to get to local files, including removable flash drives. You can also select one of the locations your accounts let you get to, sign in if necessary, and then open the file you want. To add a new location, click Add a Place. Tip: If you want to bypass File > Open and always use the Open dialog box, do this: Select File > Options > Save, and then select the Don’t show the Backstage when opening or saving files check box. Then, close and reopen any open Office applications. Note that this change only affects what you see when you press CTRL+O to access the Open Files dialog box. If you have a document on your computer, but you're not sure exactly what folder it's saved in, you can find it as long as you know at least part of the name or a bit of text that is in the document. Click the Browse button at the bottom of the places list on the left. When the Open dialog box appears, type the text you want to search for in the Search box at the top right and press enter. A list of matching documents will appear for you to choose from. On the Mac, selecting the File menu and then Open (or just pressing Command + O) gets you to the File Open dialog box. 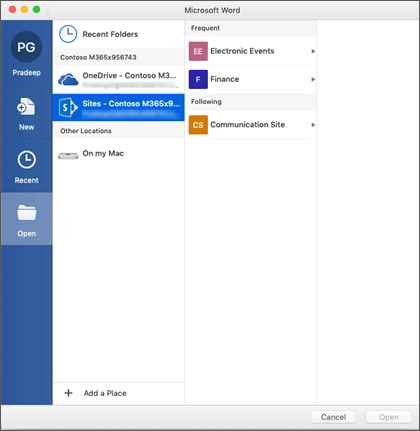 Note: On Office 2016 for Mac you may need to click the Online Locations button to get to this dialog. Double-click On my Mac to get to local files, including removable flash drives. To add a new location, click Add a Place. The Recent list shows the files that you opened recently from any of your devices. If this list gets unwieldy, you can remove files from it. Just right-click the file name and then pick Remove from Recent. If you have a file that you want to always appear on this list, regardless of how recently you've accessed it, hover over that file and select the pin icon on the right side to pin it to the list. Click the pin again to unpin it when you no longer want it to be kept permanently on the list. Have a question or feedback about Microsoft Office that we didn't address? See How do I give feedback on Microsoft Office? This article was reviewed by Ben on November 30th, 2018 as a result of your feedback. If you found it helpful, and especially if you didn't, please click the feedback controls below and leave us some constructive feedback so we can continue to improve it.